Many people consider the Chinese decorative art of feng shui as a practical, useful method for creating an inspiring, safe and inviting home. Feng shui adapts the centuries-old philosophy, bringing it into today’s modern world. While it does not promote applying customs from other cultures, it does invite you to find the things that you personally resonate with, and strategically place them in around your home to keep them fresh in your memory and intentions. 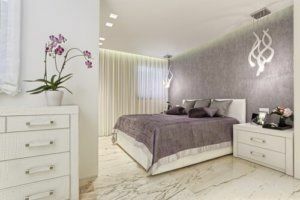 Designed to attract positive traits to a household, like money, love, harmony and opportunity, the art of feng shui also promotes simple, practical and useful ways to create a home that will enhance your life. Ditch the clutter. One of the biggest rules to follow is the elimination of clutter. Most homeowners will agree they may own too many possessions, but still feel an unwillingness to part with the things they don’t necessarily need. However, the best way to create the flow of feng shui is to eliminate unnecessary objects and hold onto the ones that contribute to the overall positivity of the house. Opt for a circular-shaped table. A circular dining table allows everyone to see each other when eating together. A feng shui standard of living is that this fills the space with love and happiness. Furthermore, being able to see each other as equals during meals makes a huge difference in communication. Create an inviting master bedroom. According to feng shui design, the master bedroom is the most important room of the house. For this reason, the master bedroom should not appear sterile; rather, it should be comfortable and cozy upon first glance. It also should incorporate a touch of eccentricity into its design — something colorful or bright in nature. For most people, the thought of home remodeling brings two emotions: 1) joy at having your dream realized; and 2) fear at how painful the process might be with some remodeling contractors. With some home remodeling contractors, the process is indeed painful. But at Republic West Remodeling, we have honed our process over nearly 18 years in business here in the Valley. It is a very different process than is typical with other Scottsdale home remodeling contractors, and one that aims to get you the dream home you truly deserve.